When we were decorating for Christmas a couple of weeks ago, I realized that now that we have a house, the Christmas decorations that used to holiday-up our apartment just fine don't seem like enough. I have a few little snowmen characters and some cute fabric Christmas trees for decoration, but in keeping with our ongoing “More is Always Better” theme this holiday season, I wanted to add on. But most importantly, I wanted to make the rest of our holiday decor myself. Last weekend, I busted out five different holiday crafts in just two mornings. This first installment of my holiday crafts are those I made with supplies I already had at home. They were all super quick and easy to make, and though they’re small, they add a nice little touch throughout the house. Tomorrow, I’ll share the two other projects I made that I had to go out and purchase supplies for. My first “already had the stuff” project was essentially two years in the making. A couple Christmases ago, I found an idea I wanted to try, bought the materials at Michaels, and then did not touch them. At all. For two years. It’s not like it’s a tedious project – it’s actually incredibly easy and quick! This jingle-bell door knob wreath took me just about 30-45 minutes to make while watching a rerun of the second-season opener of “The O.C.” (OMG can you believe Summer is has a new boyfriend?! And Marissa is messing around with the gardener!? And Caleb gets arrested?!). I grabbed my now toddler-aged package of jingle bells, along with some wire and grabbed some ribbon I already had on hand. Then I just determined the size wreath I wanted, cut the wire to that size, then simply strung the jingle bells on. I hid the spot where I tied off the wire with the ribbon, fashioned a little bow and, voila! 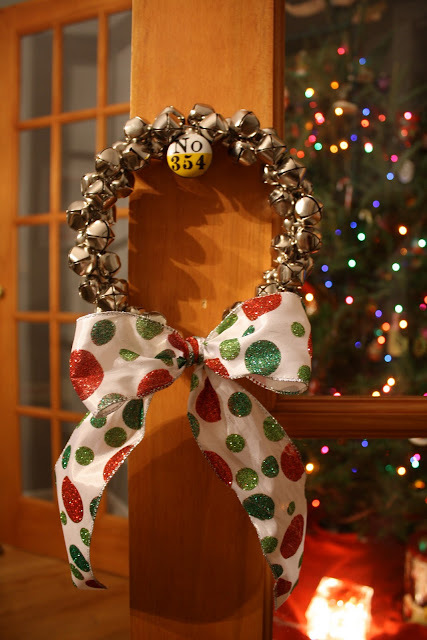 One pretty jingle-bell wreath that makes a perfect jingle-jangle sound whenever the door is opened. The next craft was probably the easiest project I’ve ever done, completed in less than 10 minutes for both pieces. 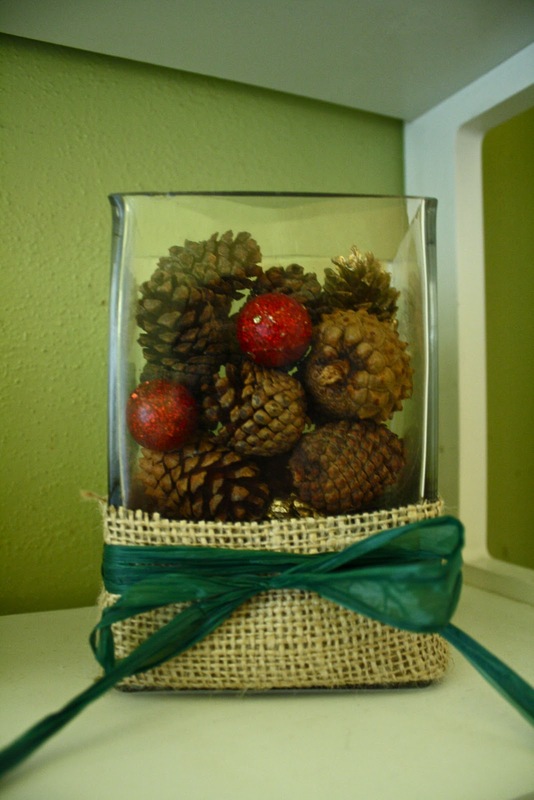 I had a bag of miniature cinnamon-scented pinecones in our Christmas decorations container, so I grabbed some of those and dumped them in two rectangle-shaped clear vases (the red berries and green sparkly star were also in the bag of pinecones). Then I cut some burlap to wrap around the base of each vase, and tied some green raffia ribbon around the burlap for a pretty, rustic finish. The two spicy-smelling vases currently sit on a shelf in our main-floor bathroom. Again: such a simple project. My third project was, again, incredibly easy and made from things I already had stashed in my craft closet. Eric and I agreed that our tree topper, Baby Sinclair, while festive, need a little boost. So I cut out a few triangles from construction paper, wrote a little holiday message on them in red glittery puffy paint (puffy paint has never gone out of style, no matter what anyone tells you), and glued them to two pieces of green-and-white baker’s twine. 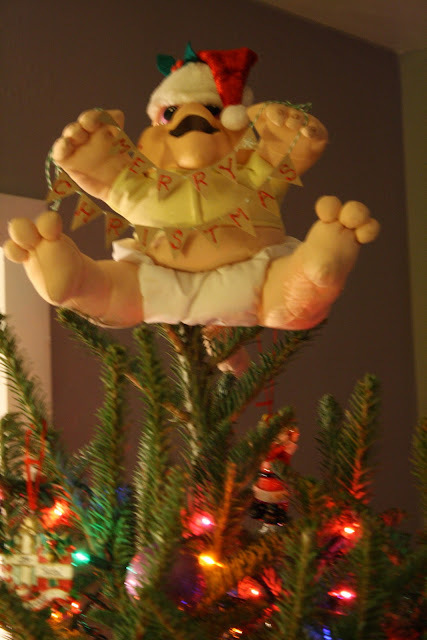 Now, Baby Sinclair wishes a joyful “Merry Christmas!” to all who spot him atop our tree. Remember to come back tomorrow to see the other two (slightly more detailed) Christmas projects I completed last weekend! ...My early childhood was scarred by that show. For some reason it freaked me out. But now? I think it's genius.